Before he would divorce Ivana and marry Marla Maples, before he would be the the man who exclaimed "You're Fired!" 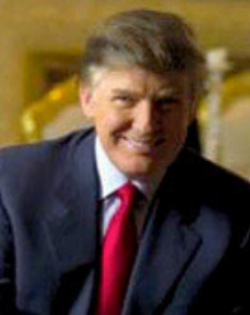 on NBC's "The Apprentice,", before he would embark on a presidential run, Donald J. Trump was a thirty-something real estate developer who bought the New Jersey Generals from J. Walter Duncan following the USFL's first season in 1983. Trump had originally looked into being a part of the inaugural group of USFL team owners a year earlier, but backed out in order to place more focus on completing the construction of his first namesake project, New York's Trump Tower. Seeing the USFL's potential and the attention it garnered on sports pages in New York and across the country, he changed his mind and grabbed the Generals when the burdens of being an absentee owner became too much for Duncan. Immediately upon buying the Gens, Trump made waves both in the media and the USFL's future. Trump fired head coach Chuck Fairbanks and replaced him with popular former New York Jets head coach Walt Michaels. He signed NFL-level talent such as DB Gary Barbaro and free agent Cleveland Browns QB Brian Sipe to shore up the Gens' on-field product and drive up player compensation as part of his plan to put pressure on the NFL. When his moves didn't produce the 1984 USFL championship, he sent Sipe packing for Jacksonville and signed Boston College standout and 1984 Heisman Trophy winning QB Doug Flutie to join 1982 winner Herschel Walker in the backfield. Behind the scenes, "The Donald" was the chief impetus behind the USFL's plan to abandon its original, spring-only season and to begin playing fall football in 1986, head to head against the NFL. He also took the reins of the USFL's antitrust suit against the NFL. Trump hoped the lawuit, rising player costs and direct competition would be enough to force the NFL to accept some USFL teams including his Generals. The plan ultimately failed when the USFL could not earn a substantial damage award in its lawsuit. Trump nearly went bankrupt in the 1990's, but rebounded after a series of complex deals. Trump became more recognizable as a brand image than anything else, thanks to "The Apprentice" as well as ventures bearing his name such as "Trump Vodka," "Trump Ice" bottled water, "Trump Golf," "Trump Institute," "Trump University," and 1989's "Trump: The Game." He later attempted to buy the Buffalo Bills before turning his attention to a presidential run in 2016.